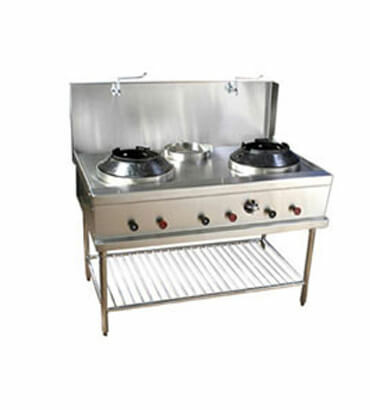 Two Chinese Burner Gas Stove Manufacturer/Supplier in India, Two Chinese Burner Gas Stove in India. We are offering two burner Chinese ranges in India. This premium quality range is made out of SS and it is suited perfectly for a Commercial kitchen. Its innovative design is ideal for Chinese dishes. Its top portion is made out of SS. We use heavy cast iron to make its outer body with a good quality burner and individual controlled NCV. Its side is covered with S. S. and has a 10/12 inch back splash and drain.